The decision has been made for the location of Rosetta’s controlled impact on Comet 67P/Churyumov-Gerasimenko on 30 September 2016, ending the mission. The spacecraft will target Ma’at, a region hosting some active pits on the small comet lobe. This region has been chosen for its scientific potential and taking into account key operational constraints involved in executing the descent. The expected time for Rosetta's contact with the surface of the comet is approximately 12:30 CEST / 10:30 UTC. More details on the timeline and likely data to be taken during the descent will follow shortly. This week's CometWatch entry is an image of Comet 67P/Churyumov-Gerasimenko from Rosetta's NAVCAM, taken on 16 July 2016 when the spacecraft was 9.5 km from the centre of the comet nucleus. The view shows a portion of Ash, on the large comet lobe, in extraordinary detail, displaying the smooth coating of dust that characterises this region. The upper left corner of the frame reveals a small part of the neighbouring Aten region, which, in contrast to Ash, is not covered in dust. 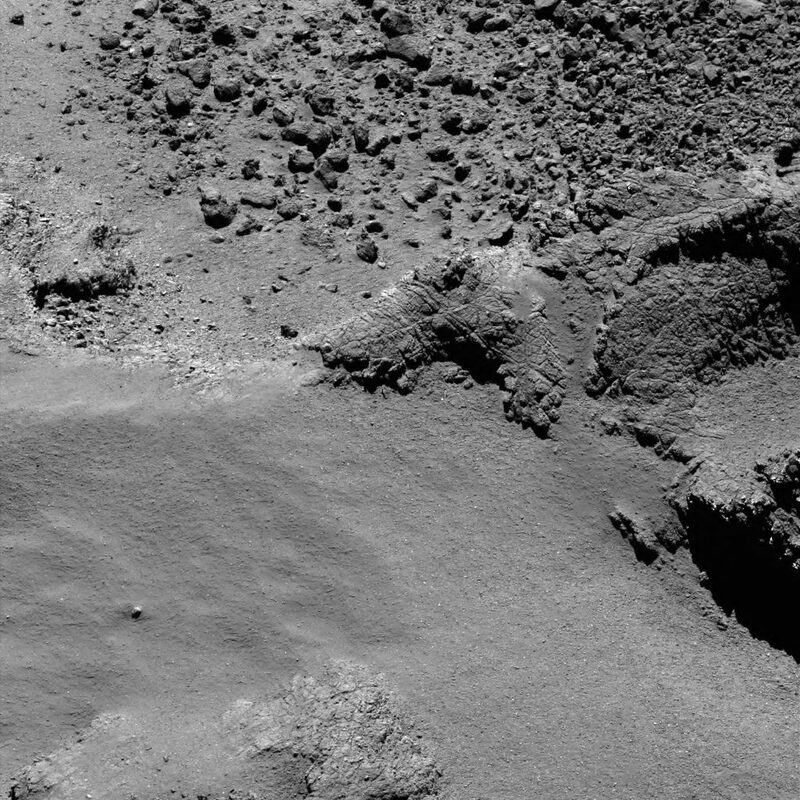 Smooth material covering another region of the comet, Imhotep, also on the large lobe, was featured in another image from Rosetta's OSIRIS narrow-angle camera, published yesterday on the OSIRIS Image of the Day. The image was taken on 16 July, and also reveals boulders of various sizes (top left), rocky terrains (upper and right sides of the frame) and a number of the circular features characteristic of the Imhotep region (lower right). Switching off the ESS is part of the preparations for Rosetta's end of mission. By the end of July 2016, the spacecraft will be some 520 million km from the Sun, and will start facing a significant loss of power – about 4W per day. In order to continue scientific operations over the next two months and to maximise their return, it became necessary to start reducing the power consumed by the non-essential payload components on board. No signal has been received by Rosetta from Philae since last July and earlier this year the lander was considered to be in a state of eternal hibernation. 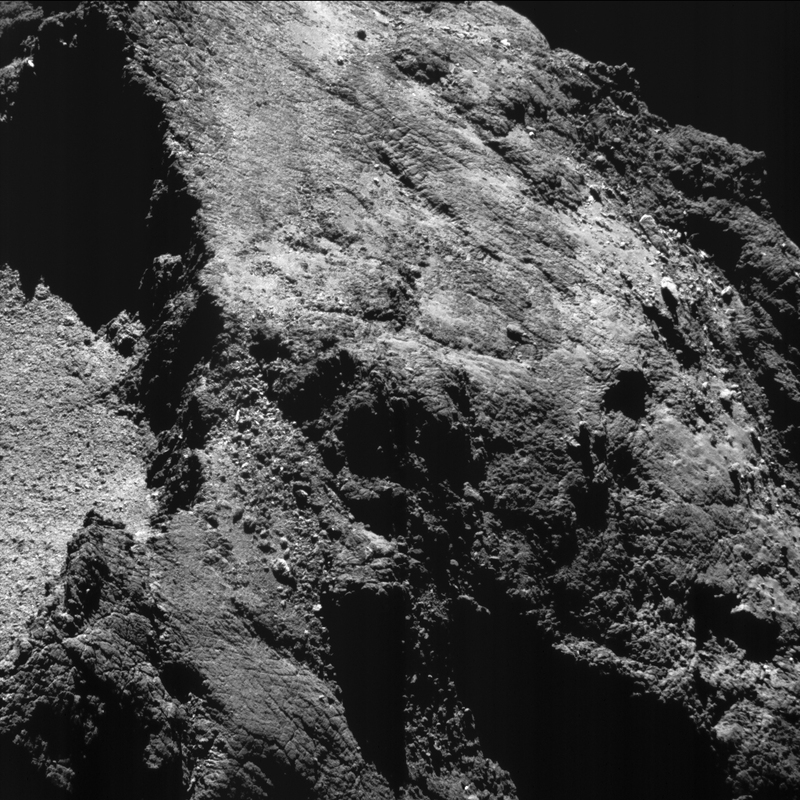 In spite of this, the ESS was kept on until now in the unlikely chance that Philae would re-gain contact. Although Rosetta has reached altitudes well below 10 km over the surface of Comet 67P/Churyumov-Gerasimenko, however, no signal from the lander was received since July 2015. 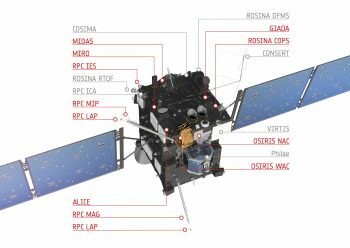 The decision was taken by the mission manager and will be implemented by the Rosetta Mission Operations Centre, in coordination with the DLR Lander Control Center and the Rosetta Science Ground Segment. This story is mirrored from the ESA Web Portal. Comet 67P/C-G on 22 March 2015. 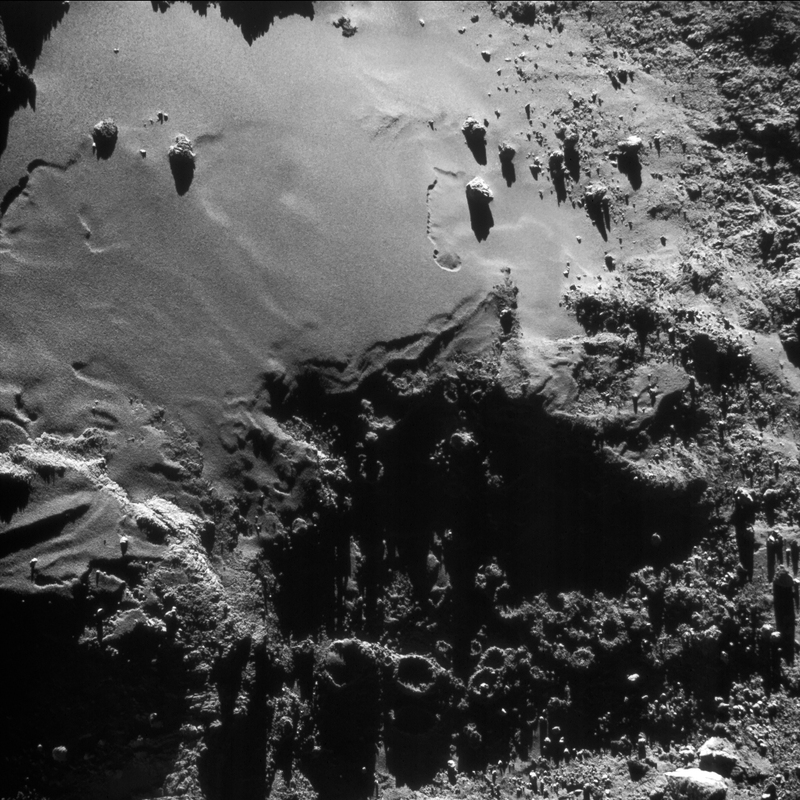 Credits: ESA/Rosetta/NAVCAM – CC BY-SA IGO 3.0. 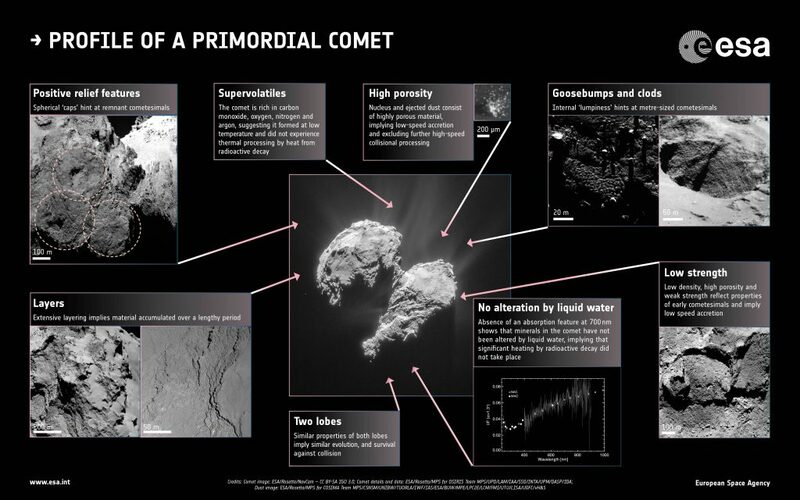 Understanding how and when objects like Comet 67P/Churyumov–Gerasimenko took shape is of utmost importance in determining how exactly they can be used to interpret the formation and early evolution of our Solar System. Legendary composer and pioneer of electronic music Vangelis has produced a brand new album, ‘Rosetta’, inspired by ESA’s Rosetta mission. The release of the album by Decca Records on 23 September coincides with the culmination of Rosetta’s 12-year mission to orbit and land its Philae probe on Comet 67P/Churyumov-Gerasimenko. 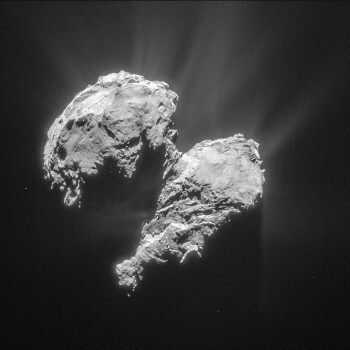 Rosetta is set to complete its journey in a controlled descent to the surface of the comet on 30 September. The story of this mission fuelled Vangelis’ long-held passion for space and inspired him to create his first new studio album in 18 years. Vangelis’ music is often linked to themes of science, history and exploration. Alongside his Academy Award-winning score for ‘Chariots of Fire’, he has written for the films including ‘Antarctica’, ‘1492: Conquest of Paradise’, ‘The Bounty’ and ‘Alexander’. “Mythology, science and space exploration are subjects that have fascinated me since my early childhood. And they were always connected somehow with the music I write,” said Vangelis. ESA’s connection with Vangelis goes back several years to when ESA astronaut André Kuipers was on the International Space Station. André is a big fan and he had a lot of Vangelis’ music with him in space. After sharing stories and experiences with André via video call from the ISS, Vangelis was inspired to write some music for ESA to mark the landing of Philae on the comet in 2014. To Vangelis, music is a sacred, basic force of the Universe, its purpose to elevate, inspire and to heal humankind. Never has this been more obvious than on ‘Rosetta’, an album that perfectly blends his fascination with the Universe and his ability to compose stirring music. “With music, you can enhance emotions and create memories: I believe that what Vangelis wanted to do was share a lasting memory of our Rosetta mission through his music,” said Carl Walker, from ESA’s Communication Department. 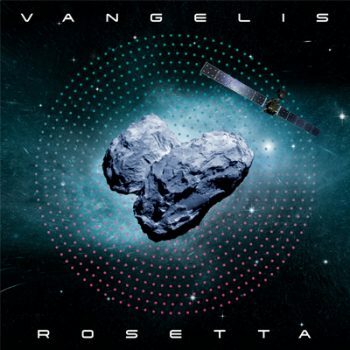 Vangelis has dedicated this new album to everyone who made the ESA’s ongoing Rosetta mission possible, in particular extending the track called ‘Rosetta’s Waltz’ as an expression of his appreciation to the mission team. “Rosetta has been an amazing journey for everybody involved, both scientifically and technically, but it has also connected emotionally with so many people around the world,” said ESA’s Prof. Mark McCaughrean, Senior Science Advisor in the Directorate of Science. The field of view includes the CONSERT search ellipse that has guided the search for Rosetta’s lander Philae since it landed unexpectedly in the yet-to-be identified location known as Abydos (check this animation for a reminder of the search area). 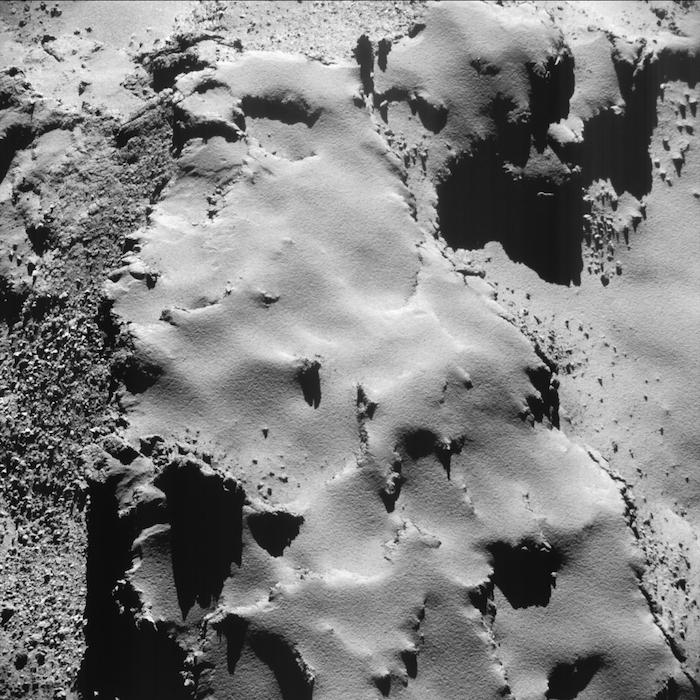 The image also captures beautiful details of the cross-cutting fracture patterns that prevail in many locations all over the comet; they are particularly prominent towards the left of this scene. 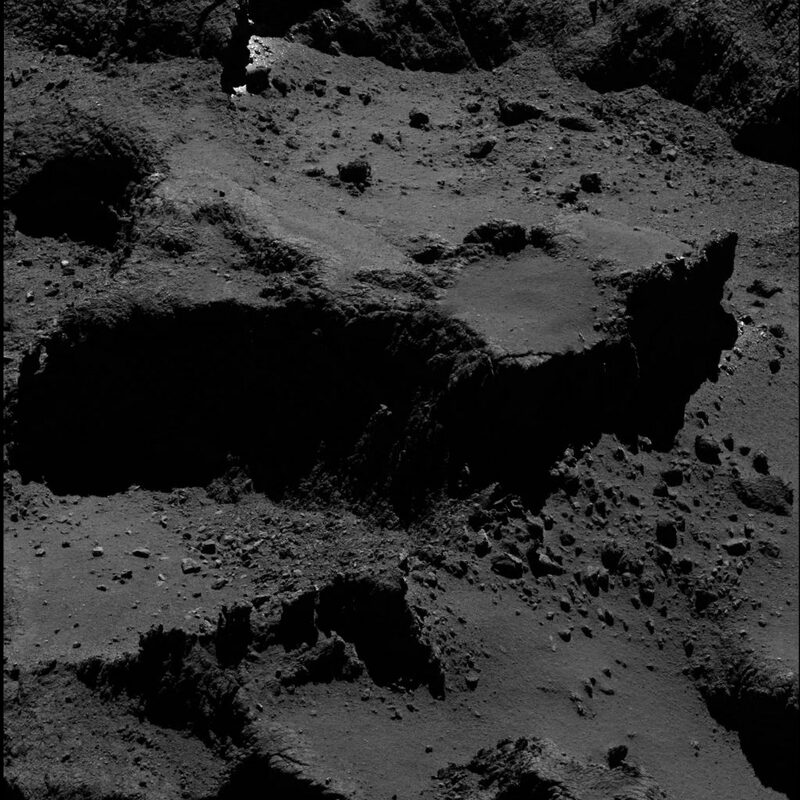 Numerous boulders cling to the surface, and in some places – notably in the lower left quadrant of the image – cast impressively long shadows across the comet’s surface. To the right and above, long shadows are also cast by local variations in topography. 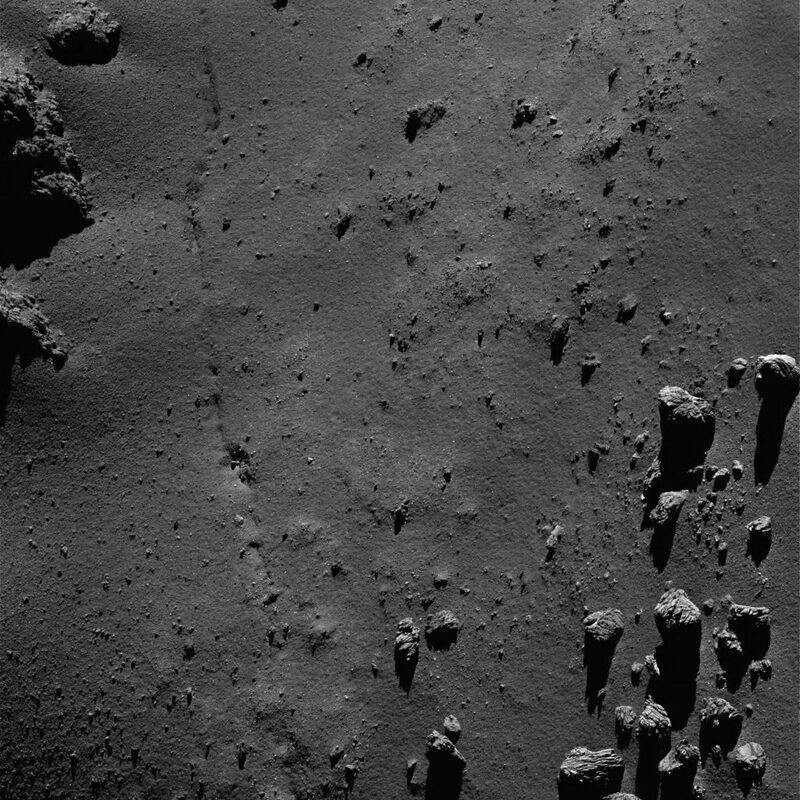 Meanwhile a close-up view of part of the ‘neck’ region of the comet, Hapi, was released via the OSIRIS Image of the Day site earlier this week (above). It shows hints of the crack snaking through the Hapiregion, with some portions apparently infilled by dust. This image also shows incredible details on the boulders and outcropping material that pockmark the smooth, dust-laden neck, with fractures permeating even at these smaller scales. 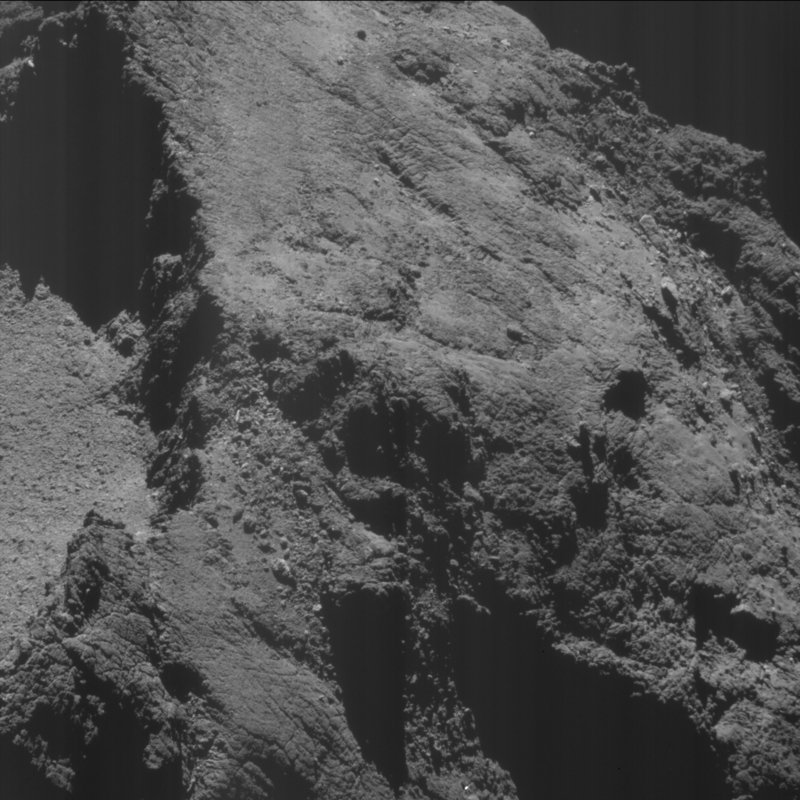 Fractures of a different kind are seen in the OSIRIS narrow-angle camera image taken 23 July and released yesterday (above), notably the fracture along the cliff edge close to the centre of the image. Fractures like these have been spotted along the edges of numerous cliffs in this region – Seth – and are likely a precursor to collapse, as suggested by the jumbled debris that is typically seen at the base of cliffs. 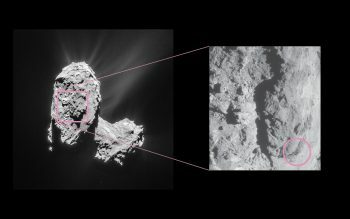 During that time Rosetta has mapped the comet’s curious shape and given us awe-inspiring views from near and far, spotting changes in its surface features and watching as jets of gas and dust stream out in to space – sometimes unexpectedly as sudden outbursts. 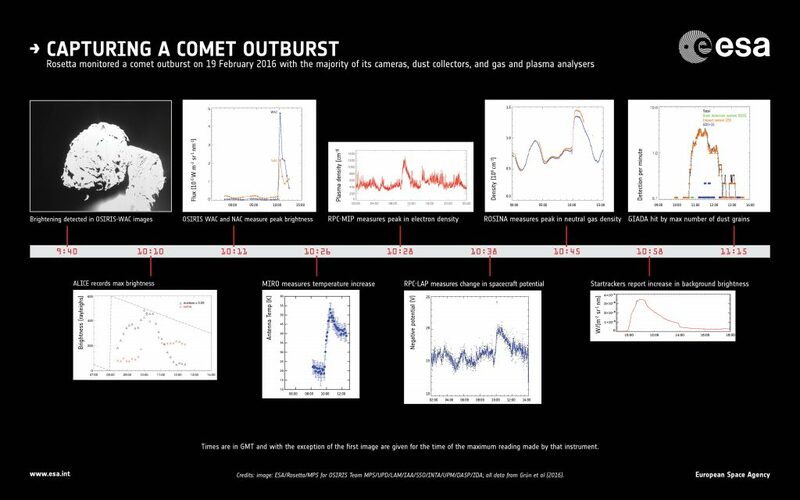 The spacecraft has performed daring close flybys and made distant excursions to sample gas, dust and plasma at a range of distances, giving unparalleled insight into the processes that operate at the comet and how it interacts with its environment as it hurtles through space. In two years, the comet has travelled around 1.5 billion km along its orbit around the Sun, passing through perihelion last August – its closest approach to the Sun – and putting on a spectacular fireworks display as its activity reached a maximum. Unlike this time last year, when the comet was so active that Rosetta could only observe it from a safe distance of 200–300 km, the activity has since subsided and the spacecraft is now operating at much closer distances, as reflected in this image, captured on 6 August 2016 from 8.5 km. The scale is 0.7 m/pixel and the image measures about 700 m across. It shows a close-up view of part of the comet’s small lobe, encapsulating some of the large depression known as Hatmehit and its steep cliff walls (left), and the contrasting heavily fractured terrain of Wosret (bottom) and Bastet (top). A portion of the horizon is also captured in the distance, at the top right. Local variations in topography and individual large boulders cast impressive shadows across the scene. For example, the details of the cliff edge at the top left are recorded in the shadows it casts on the floor below. 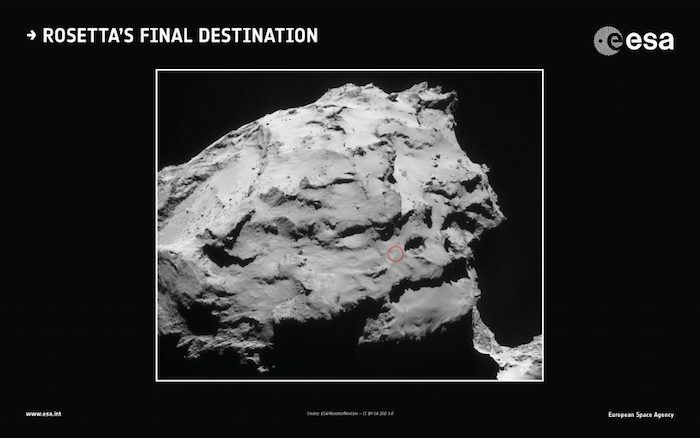 The area close to the bottom of the image has been the focus of imaging campaigns attempting to find Rosetta’s lander Philae, where it is thought to have bounced in November 2014, but has yet to be confirmed. With Rosetta still flying alongside, the comet is now heading back towards the outer Solar System. As such, power is falling, and Rosetta’s thrilling mission will soon conclude in a grand finale: it will make a controlled impact onto the surface of the comet on 30 September. This image is featured as ESA's Space Science Image of the Week. Subscribe to the mailing list by e-mailing your request to osiris-pi@mps.mpg.de. OSIRIS was built by a consortium led by the Max-Planck-Institut für Sonnensystemforschung, Göttingen, Germany, in collaboration with CISAS, University of Padova, Italy, the Laboratoire d'Astrophysique de Marseille, France, the Instituto de Astrofísica de Andalucia, CSIC, Granada, Spain, the Scientific Support Office of the European Space Agency, Noordwijk, The Netherlands, the Instituto Nacional de Técnica Aeroespacial, Madrid, Spain, the Universidad Politécnica de Madrid, Spain, the Department of Physics and Astronomy of Uppsala University, Sweden, and the Institut für Datentechnik und Kommunikationsnetze der Technischen Universität Braunschweig, Germany. 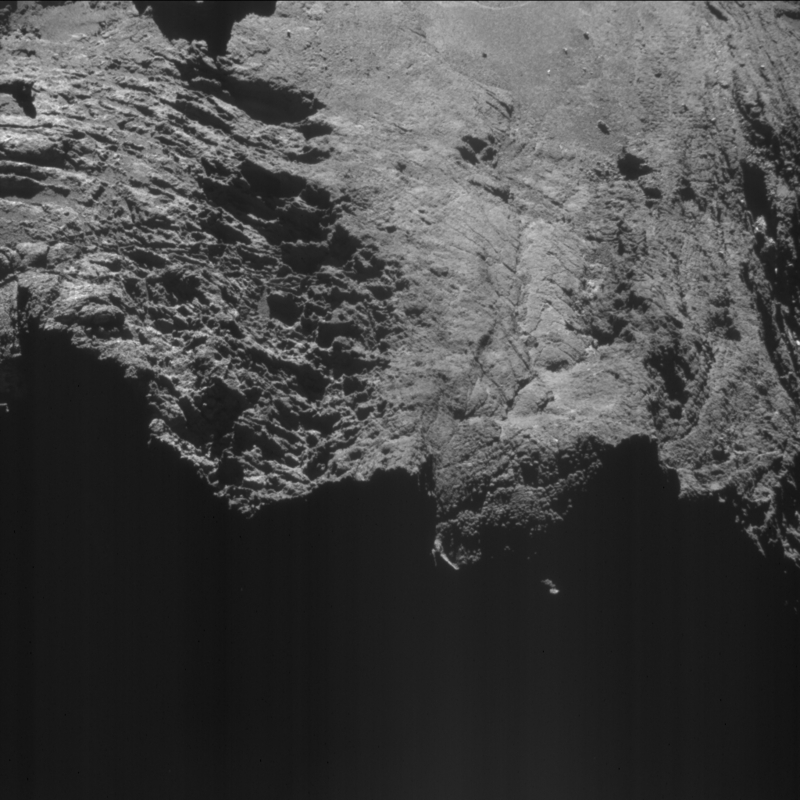 Enhanced NAVCAM image taken from a distance of 10.6 km to the centre of comet 67P/Churyumov-Gerasimenko on 8 August 2016. The image scale is 0.9 m/pixel and the image measures about 930 m across. Credits: ESA/Rosetta/NAVCAM – CC BY-SA IGO 3.0. 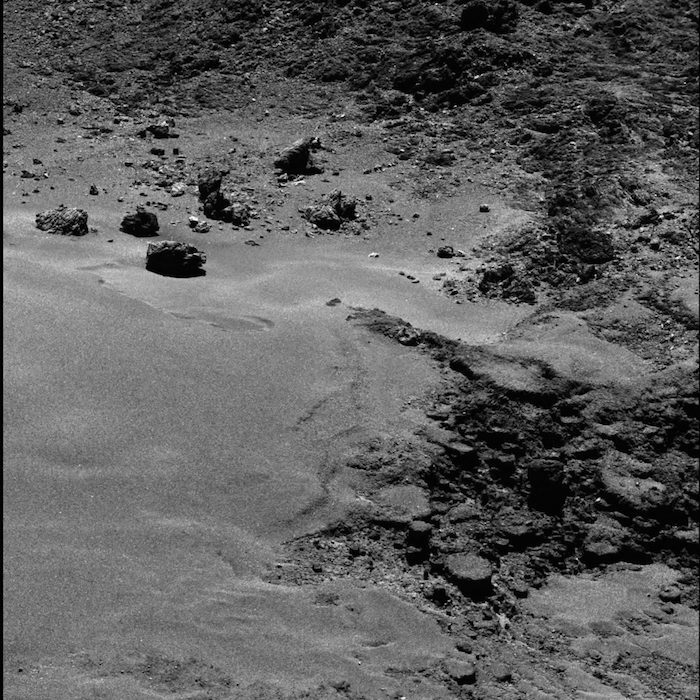 The NAVCAM image, taken from a distance of about 10.6 km from Comet 67P/Churyumov-Gerasimenko on 8 August, shows a spectacular close-up of details close to the boundary of Atum (foreground and left) and Anubis (the smoother region towards the top). To the left, the scene shows exposed layers with smoother material lying in between, which transitions into a heavily eroded zone before taking on a smoother appearance again in the centre, albeit scarred with fracture-like features cross-cutting at a range of scales. Layers can also be picked out towards the top right, some of which have the appearance of being folded, as seen in other images of the Anubis region. The OSIRIS team have also shared a number of new views via their image of the day website. An image captured on 3 August (above) shows a striking contrast between very smooth plains, highly fractured outcrops, and a boulder strewn surface – all within a ~300 x 300 m square region in Seth. Meanwhile an image captured on 6 August (above) – the two year anniversary of Rosetta arriving at the comet – shows a heavily fractured region in Bastet, on the comet’s small lobe. A relatively smoother patch, home to an array of boulders, sits within the fractured terrain. 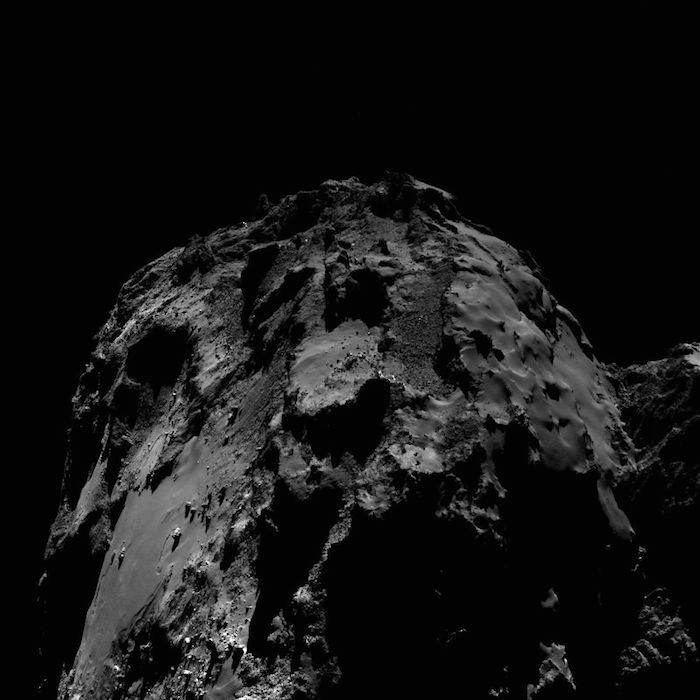 Finally, a great view over the large lobe was captured by Rosetta’s OSIRIS wide-angle camera on 10 August (below). It really shows off the curvature of the comet, and the contrasting terrains of Imhotep (left), Khepry and Aten (top/middle) and Ash (right). And in case you missed it…don’t forget our two-year anniversary NAVCAM image here! This week's CometWatch entry was taken with Rosetta's NAVCAM on 17 August 2016, when the spacecraft was 13.9 km from the nucleus of Comet 67P/Churyumov-Gerasimenko. 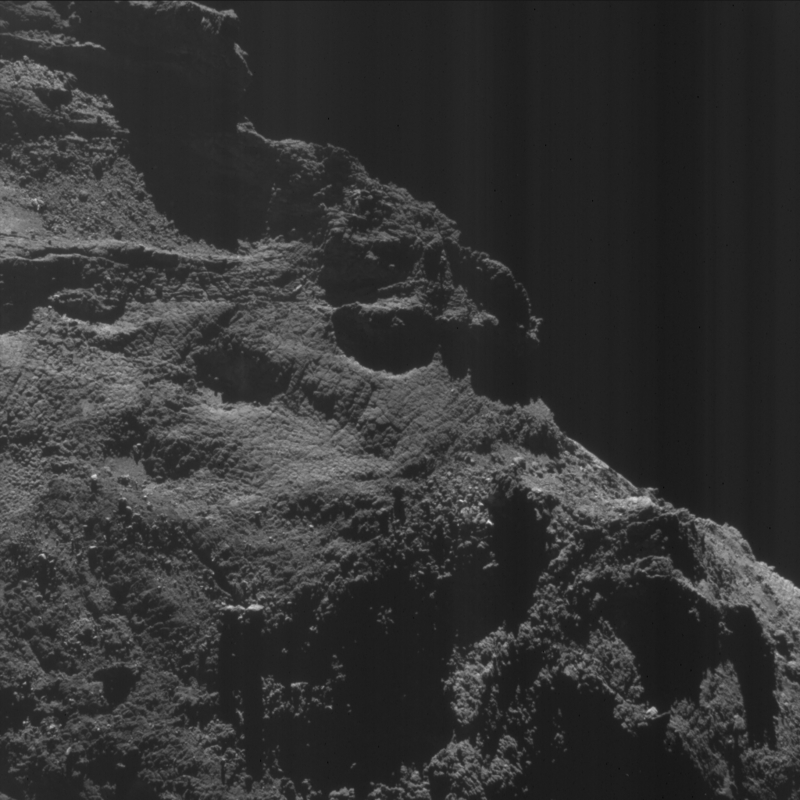 This close-up view shows a portion of the Imhotep region, on the large comet lobe. The top part of the image portrays the flat, smooth-covered portion of Imhotep, scattered with a variety of boulders of different sizes. Towards the top right is a cluster of three large boulders, including the 45-m sized Cheops, named after the Great Pyramid at Giza near Cairo in Egypt. Around the comet's perihelion, Rosetta observed many spectacular changes on this portion of Imhotep (see blog post 'Comet surface changes before Rosetta’s eyes'). 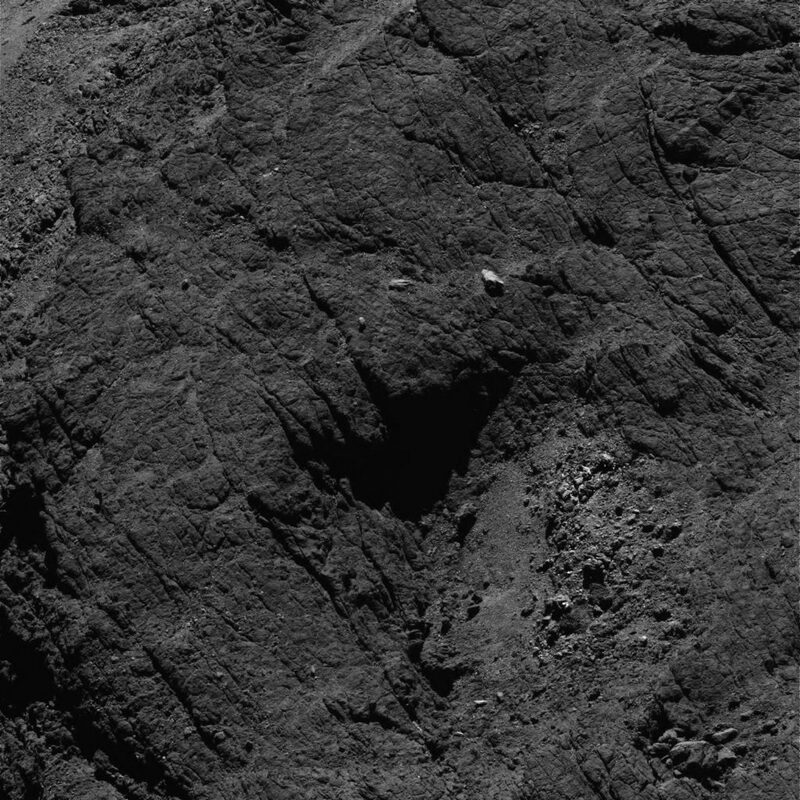 To have an idea of the surface changes, you can compare the new CometWatch with a number of images of the same region taken in the past months by Rosetta: from early images such as CometWatch 26 October 2014 and the close fly-by of 14 February 2015 to more recent ones, for example this OSIRIS wide-angle camera image taken on 25 May 2016.